All printing is done with a HP Designjet Z3100 Photo printer and HP Vivera inks. With these pigment inks, prints last longer and present a wider colour gamut compared with dye inks uses in most small inkjet printers. The print quality is significantly improved over that of popular photographic papers used by commercial developers. Gloss enhancer is used on all our satin and gloss prints, to eliminate gloss differential and seal the print further, making it waterproof. Our system is colour-profiled on a regular basis, and ICC profiles for our current print media are available below. Custom media is available, please contact us to discuss alternatives. Photo printing services are tailored to photographic images, or posters where a satin or gloss finish is desired. Our current paper for both satin and gloss finish is HP Everyday Pigment Photo, a 235 gsm paper that offers relatively wide gamut and excellent water-resistance, as well as low cost. For premium photo printing, a paper of higher quality (and cost) to that of the regular photo printing service is used. The paper has an extended gamut and less gloss differential. The weight of the paper is also higher, at 260 gsm. Our current premium photo paper is HP Premium Instant Dry. Fine art printing is suited to high quality photographic sources, especially black and white images. We currently offer Hahnemühle Photo Rag 308 as our fine art paper. Fine art paper offers excellent archival characteristics, as well as imparting a slight texture to the print. The fine art baryta papers offer a new and exciting addition to the world of fine art printing. These new papers have all the same virtues as the traditional matte fine art papers but also benefit from the satin finish to produce even brighter and more vibrant prints. We currently offer Hahnemühle Photo Rag Baryta 315. Fine art paper offers excellent archival characteristics, as well as imparting a slight texture to the print. Poster printing is suited to posters and line art, or other printing where a matte finish is required. The cost is kept low by a lightweight 130 gsm paper, HP Heavyweight Coated. Our photo album printing is done on some of the best fine art paper from Hahnemühle. These finely made albums are perfect for creating a long lasting memory of a special occasion or as a present. The albums come with 20 double sided pages and interleaf paper. It is possible to add extra pages at an additional cost. The covers are available in two ranges: a black leather cover with Photo Rag Duo paper and a non-leather silver or black cover with Natural Art Duo paper. Please email Kat to order or for more details. 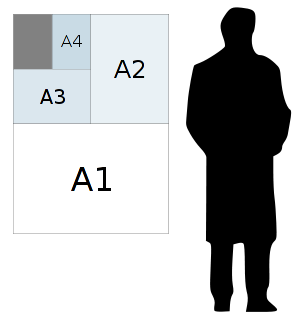 A comparison of print sizes compared to the average height of a person is shown below. Minimum order size of two A4 or A3 prints, one of all other print sizes. 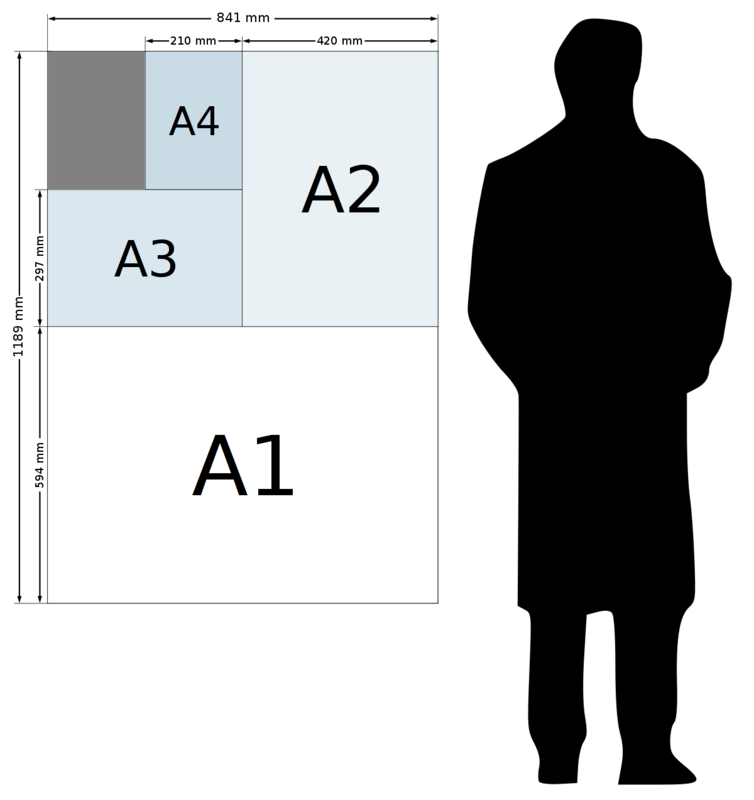 Standard sizes are taken from the ISO A system, with other sizes being common in the photographic world. Custom sizes upto 600 mm wide and several metres in length are possible, contact us for details. Delivery at cost anywhere in the world through Deutsche Post, contact us for price.